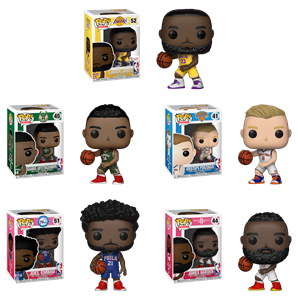 Funko Partners with Foot Locker on Release of New NBA Pop! Line | Funko, Inc.
EVERETT, Wash., Nov. 20, 2018 (GLOBE NEWSWIRE) -- Funko, Inc. ("Funko,” or the “Company”) (Nasdaq: FNKO), a leading pop culture consumer products company, today announced that it is now selling Pop! NBA figurines at Foot Locker (NYSE: FL). The Pop! players available include James Harden, Joel Embiid, Giannis Antetokounmpo, Kristaps Porzingis, and LeBron James, in an exclusive Los Angeles Lakers gold Icon Edition jersey. The Pop! players available include James Harden, Joel Embiid, Giannis Antetokounmpo, Kristaps Porzingis, and LeBron James, in an exclusive Los Angeles Lakers gold Icon Edition jersey. Foot Locker will sell the NBA Pop! line at approximately 60 locations throughout the U.S., as part of its new POP by Foot Locker product offering, which brings pop culture to retail through curated and timely product collaborations. For more information, visit www.footlocker.com/PopbyFootLocker. Headquartered in Everett, Washington, Funko is a leading pop culture consumer products company. Funko designs, sources and distributes licensed pop culture products across multiple categories, including vinyl figures, action toys, plush, apparel, housewares and accessories for consumers who seek tangible ways to connect with their favorite pop culture brands and characters. Learn more at https://www.funko.com/, and follow us on Twitter (@OriginalFunko) and Instagram (@OriginalFunko). Foot Locker is part of Foot Locker, Inc. (NYSE: FL), a specialty athletic retailer that operate approximately 3,270 stores in 26 countries in North America, Europe, Asia, Australia, and New Zealand. Through its Foot Locker, Kids Foot Locker, Lady Foot Locker, Champs Sports, Footaction, Runners Point, Sidestep, and SIX:02 retail stores, as well as its direct-to-customer channels, including Eastbay.com, footlocker.com, and SIX02.com, the Company is a leading provider of athletic footwear and apparel. THINK450 is the innovation engine of the NBPA, charged with creating disruptive and substantive business relationships for the most marketable athletes on the planet. THINK450 represents every current NBA player and works with leading companies and brands across all industries to help its members capitalize on growth opportunities in the content, marketing, technology, and licensing arenas – among others. For more information, please visit THINK450.com.